San Francisco-based Salesforce Inc. launched a new solution on Thursday, Salesforce for HR, that takes the cloud software companies would normally use to serve their customers and instead use it to serve their employees. Salesforce for HR isn’t about a new software product from the cloud platform that started with customer relationship management (CRM) and has since broadened its offerings to cover just about every line of business. It’s about taking its existing tools and using them in a new way, perhaps facilitated with the help of a Salesforce partner such as Deloitte, Appirio, Jobscience or Lumesse. In a demo showcasing how some Salesforce customers have already geared the cloud platform towards a human resources purpose, Jim Sinai, senior director of platform product marketing at Salesforce.com, said that employees expect to be catered to as if they are customers. 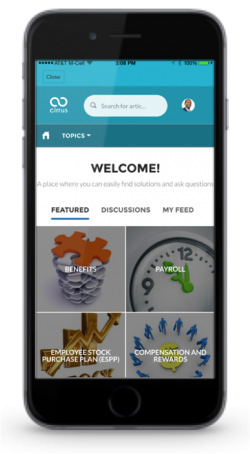 An example of an app that could be built with Salesforce for HR purposes. 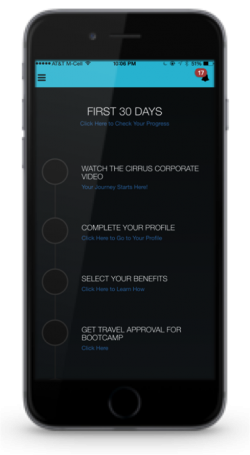 In the demo, an app that Cirrus Insight built to help onboard its employees was showcased. Employees would be guided step-by-step through the process of being integrated into the company, and an HR manager could track their progress. The app could be built with Salesforce Lightening and deployed via the Salesforce1 mobile app. Another example demonstrated was an HR help desk app, putting Salesforce’s Service Cloud and Communities to use. Employees would have a portal available on web and mobile to explore information about company benefits, payroll information and vacation policies. HR managers would have a view of what questions were being asked about these topics and the ability to answer them, manage content in the portals, and see profile information about the employee asking the question. Salesforce for HR could also make use of Sales Cloud, Service cloud, Marketing Cloud, Community Cloud, and Analytics Cloud solutions on the Salesforce1 platform. Rather than sell the solution with a bundle of software, it is tailored for a customer’s needs by a Salesforce partner. Salesforce suggests that its solution can complement existing human capital management (HCM) deployments or human resources management systems (HRMS). But Marylka Empey, president of the Ontario Institute for Canadian Association of Management Consultants, wonders how that linkage would be made. Empey also says using Salesforce’s platform to address HR tasks might not live up to what’s offered on the market by software developers that have built their tools from the ground up with HR in mind. Current Salesforce users are best positioned to take advantage of the solution, according to Sinai. Salesforce for HR is generally available today. Pricing is determined based on each customer’s needs.